Are you thinking about buying a DJI Mavic 2 Zoom drone? Let me present its eight greatest strengths and three main weaknesses. Obviously, we all know the DJI Mavic 2 Zooms greatest advantage: it has a zoom function. It features a 2x optical zoom. 24 – 48 mm. Moreover, the camera is fully three-axis stabilized, making the shots look gorgeous. Create recordings like never before with the narrow cinema look that until now only big-budget productions could afford. The DJI Mavic 2 Zoom records with a bitrate of 100 Mbps. That’s a whole lot of data for such a small drone, but precisely what ambitious filmmakers look for in a camera. The DJI Mavic 2 Zoom features omnidirectional obstacle avoidance sensors. And they mean it this time. Two cameras face the front, two face the back, at each side, there is another camera, even at the bottom users find two cameras, plus an infrared sensor. And now, to sum it all up, DJI even added an infrared top facing sensor. Take that. Omnidirectional protection! The DJI Mavic 2 Zooms camera can only take 12MP photos, like its predecessors. However, with its smart super res mode, it can create 48MP photos. And because it uses its optical zoom, the final result looks like an authentic photograph, not like a wide-angle panorama. By the way, the DJI Mavic 2 Zoom records videos in 4K @ up to 30fps. The new DJI Mavic 2 Zoom is robust! I tried a lot to get it to give up. But it didn’t. Even when I got it to crash (by turning off the obstacle avoidance sensors and on purpose flying into a tree) it kept on working and flying as if nothing would have happened at all. The DJI Mavic 2 Zoom is a beast! The new hyper-lapse mode creates stunning shots. Watch, enjoy and create them yourself with just a few tips on the monitor of your smartphone. The flight time of the DJI Mavic 2 Zoom has been raised. The manufacturer claims that it can stay airborne for 31 minutes, which I think is rather a myth, but with an average flight time of approximately 26 minutes, the drone sets a new standard. We should keep in mind how many sensors it powers. It’s pretty incredible. Last but not least, the DJI Mavic 2 Zoom has a maximum range of 8km. And the signal it transfers is not an HD signal anymore, but DJI upgraded it to Full HD. Enjoy up to 8km of range with a Full HD signal. That’s impressive! And here are the top three disadvantages of the new DJI Mavic 2 Zoom Drone. The DJI Mavic 2 Zooms camera is not removable. It’s a bit of a shame that DJI released two new drones and to profit from both cameras, you have to buy both drones. You cannot buy one plus a separate camera and then swap it, if needed. That’s definitely a big downside. Unfortunately, the DJI Mavic 2 Zoom records footage with standard 8-Bit, not with 10-Bit, as the also new DJI Mavic Pro 2 that features an inbuilt Hasselblad camera (though without a zoom). Color grading enthusiasts might see this as a real disadvantage. 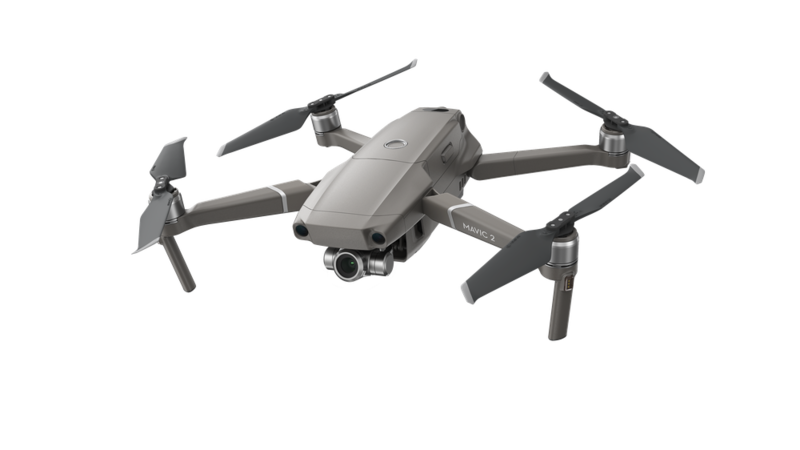 If 10 Bit is a must for you, then check out the Mavic Pro 2 drone. The sensor of the DJI Mavic 2 Zoom, a standard 1/2.3’’ CMOS model, is small and could have been enlarged. That would have been amazing for the quality of the recordings. If you want to buy a DJI Mavic 2 Zoom, click here! If you rather want to take a look at an alternative, click here! The post Israel’s Airobotics Opens Headquarters in the US appeared first on Dronethusiast. The post Drone Analytics Startup Uses $2M Investment to Take Flight appeared first on Dronethusiast. The post The FAA Drone Tracker Has Officially Launched appeared first on Dronethusiast. The post Drones at Burning Man 2018 – Excelling the Exceptional appeared first on Dronethusiast. The post Altair Aerial Tomahawk | Camera Drone Review  appeared first on Dronethusiast. The post ‘Flying Battery’ Can Last Up to 2 Hours appeared first on Dronethusiast. The post World’s Largest Offshore Wind Farm Captured by Drone appeared first on Dronethusiast.